This bioregional assessment considered the potential cumulative impacts on water and water-dependent assets due to four future additional coal resource developments in the Gloucester subregion of NSW (Figure 1). The assessment is a regional overview of potential impacts on, and risks to, water-dependent ecological, economic and sociocultural assets, identifying where potential changes in water resources and ecosystems may occur, and ruling out areas where impacts are very unlikely. Governments, industry and the community can then focus on the areas that are potentially impacted and apply local-scale modelling when making regulatory, water management and planning decisions. Headline finding: Expanding coal mining and coal seam gas development is predicted to cause minimal impacts on water resources and water-dependent assets in the Gloucester subregion. Groundwater: An area of 100 km2 has at least a 5% chance of greater than 0.2 m drawdown due to additional coal resource development. Of this, an area of 52 km2 potentially already experiences drawdown due to baseline coal resource development. See Groundwater. Surface water: There is at least a 5% chance that low-flow days in 43 km of streams around the Rocky Hill, Stratford and Gloucester Gas developments could increase by more than 20 days per year due to additional coal resource development. Changes in high-flow days and annual flow are smaller. See Surface water. Ecosystem impacts: Hydrological changes may be experienced in parts of riverine ecosystems (242 km of the total 344 km of streams) and groundwater-dependent ecosystems (3.3 km2 of total 10.3 km2). Modelling predicts the resulting ecosystem impacts to be minimal. See What are the potential impacts of additional coal resource development on ecosystems? Asset impacts: Almost all sociocultural and economic assets are very unlikely to be impacted. Detectable impacts on ecological assets are likely to be restricted to the north of the subregion, and are expected to be minor and localised near additional coal resource development. See What are the potential impacts of additional coal resource development on water-dependent assets? Throughout this synthesis, the term ‘very likely’ is used where modelling predicts a greater than 95% chance of something occurring, and ‘very unlikely’ is used where modelling predicts a less than 5% chance. 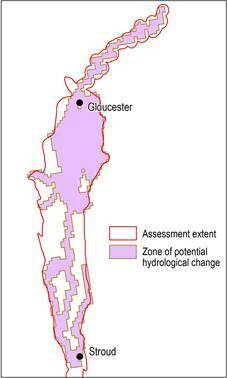 The pink zone (defined further in Box 4) was developed for the Gloucester subregion to identify the area, outside of which impacts are ruled out. The assessment of potential impacts was therefore focused within this zone, which combines (i) the area with at least a 5% chance of exceeding 0.2 m drawdown due to additional coal resource development, and (ii) the area with at least a 5% chance of exceeding changes in specified surface water characteristics that arise due to additional coal resource development.